The Huawei Mate 9 isn’t what you’d call an eye-catcher. The device looks quite inconspicuous, features a discrete exterior and lacks that certain wow factor. On the flipside of the coin: it does have a very clean and practical design. Most likely, that is why the Mate 9’s build quality is excellent and its finish near flawless. 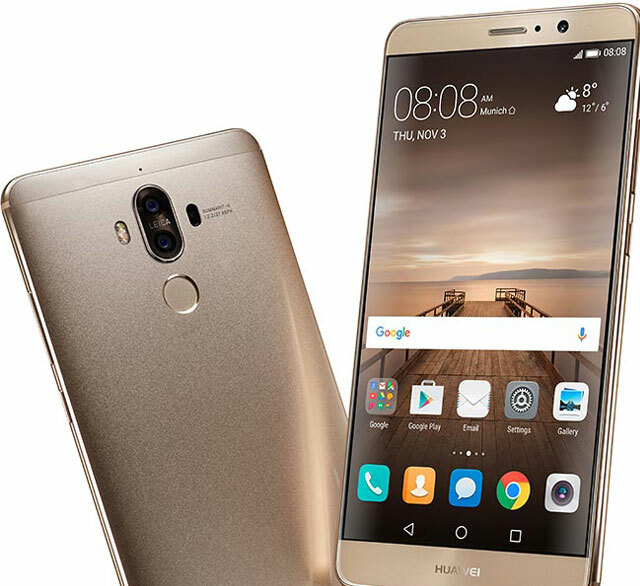 In addition to the high-end Mate 9 (R10 999), Huawei recently also launched the midrange Nova smartphone (R6 999). The Nova is aimed at consumers who don’t want to break the bank and don’t specifically require the cream of the crop when it comes to hardware. This review focuses mainly on the Huawei Mate 9, but also shows how the two devices stack up in terms of raw performance and battery life. The Mate 9’s front and rear don’t show any significant visual highlights. The phone therefore exudes a clean and practical look. Most noticeable are a coloured LED notification light right next to the front camera and slightly protruding dual-camera sensors, combined with LED flashes, on the rear. Its fingerprint sensor, which is identical to the one on Google’s Pixel device, is elegantly integrated into the case. Because it is located on the back, unlocking the phone while resting flat on its back, or in a car holder, requires you to pick it up first. The Mate 9 has two separate speakers. The standard speaker that is used for voice calls is located at the bottom — therefore not adding to the size of the bezel. Only when playing media (music or YouTube videos, say) does the second speaker join the party. This top speaker is noticeably less impressive when it comes to low frequencies than the bottom none. Nonetheless, the Mate 9 can deliver above-average sound quality. Higher frequencies, however, can be quite ear-piercing. It mainly impresses with relatively acceptable low-frequency bass sounds. The integrated fingerprint reader is reasonably snappy, but proved slightly slower than those of other high-end smartphones. The exact same sensor that scans your fingerprint can also be used as a shutter button when taking pictures, to answer incoming calls and even as a touchpad for browsing through photos. For a device with a huge, 5,9-inch display, the bezels are particularly small. Dimensions and weight are comparable to that of its predecessor, the Mate 8. In the end, for an XL-sized smartphone, the Mate 9 looks great, feels great and has just the right dimensions. The slightly curved back helps with a comfortable feel and grip. Still, large handsets remain more cumbersome to hold and operate than smaller models. To put its dimensions into context, it is just about the same size as Apple’s 5,5-inch iPhone 7 Plus. Positioned at the top-front of the device is a tiny infrared eye that, when combined with the preinstalled smart remote app, can control a whole range of other devices that support infrared input, including televisions, media players and sound systems. Sounds great on paper, right? In practice, the infrared output proved far too weak. One really needs to aim precisely at the receiving device for it to work, and that quickly becomes annoying. On the left side of the Mate 9, there’s a small slot to insert two Sim cards, or one Sim card and a microSD card. Don’t worry about a lack of storage space when using two Sims, though: the phone comes with a generous 64GB of flash storage. Build quality of the Mate 9 is excellent. Despite its considerable dimensions, the device sits comfortably in your hand and the buttons and other elements feel premium and durable. The rear is aluminium, except for the top and bottom strips, which are made from plastic to keep antenna performance optimal. There’s no reason to expect the Mate 9 to scratch easily. Still, if you’re very keen on a pristine-looking phone, there’s always the option to supply it with a protective case. And Huawei has included a simple yet effective transparent case in the box. The case itself, made of hard plastic, will scratch easily, but it does a good job protecting the device itself. The screen of the Huawei Mate 9 is a bit of a disappointment. Although I’m no big fan of ultra-high pixel displays, the 1 920 x 1 080-pixel resolution of the Mate 9 is low for a high-end phone, especially one with a screen that’s almost six inches. When compared to similarly sized screens with 2 560 x 1 440 resolutions, the difference is visible with the naked eye. With a price tag as high as the Mate 9’s, we would have expected more. On the upside, the full HD screen has a positive impact on performance and battery life (more on that later). 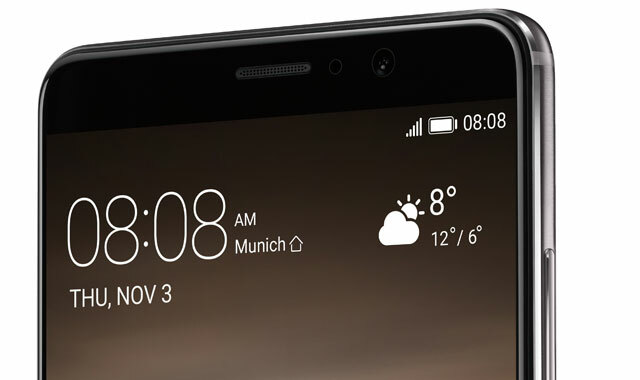 Another reason for feeling a little let down by the Mate 9’s screen is the fact that Huawei continues to implement less than cutting-edge LCD technology, instead employing superior Oled panels. This choice inherently means contrast ratios are considerably lower (1 400:1) than on phones using Oled technology such as Samsung’s Galaxy S7 Edge. Oled-equipped smartphones can effectively turn a single pixel completely off, so black is infinitely darker than on any LCD device where pixels always remain switched on. Putting that gripe aside, the LCD screen of the Mate 9 does a decent job when stacked up to the Apple iPhone 7 Plus (which has a contrast ratio of 1 375:1). Also, the Mate 9’s measured maximum brightness levels (640cd/m²) are top of the line. To put that into perspective, the iPhone 7 Plus features a 520cd/m² screen while the Samsung Galaxy S7 maxes out at 655cd/m². It’s a shame the Mate 9 doesn’t have a “boost” mode that automatically pushes brightness to the absolute maximum in direct sunlight. Nonetheless, screen content on the Mate 9 remains easy and comfortable to read in brightly lit environments. Furthermore, viewing angles are excellent. When looking at the screen from the side, we couldn’t detect any noticeable discolouration or fading, which is something that lower-end devices in particular are troubled by due to cheap and technically inferior display panels. 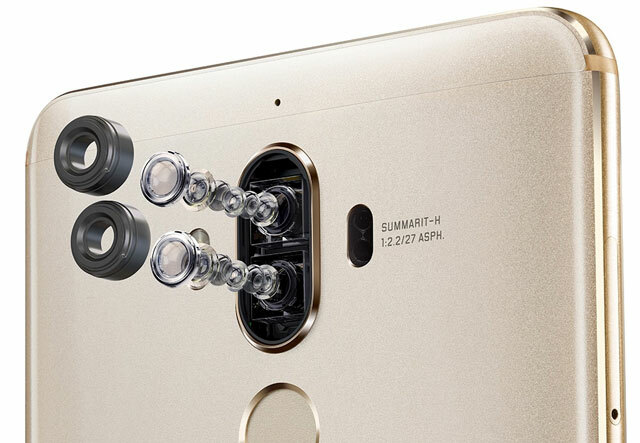 Like some other recently launched high-end smartphones, the Huawei Mate 9 features a dual-sensor rear camera. The second, exclusively black-and-white sensor can capture images at 20 megapixels, while the sensor that focuses on the rest of the light spectrum captures at a “mere” 12-megapixel resolution. Both sensors feature an f/2,2 aperture, optical image stabilisation and a dual-LED flash. In addition, the Mate 9 is perfectly capable of recording razor-sharp looking video fragments in 4K resolution (3 840 x 2 160) — they just can’t be played back on the phone. Unfortunately, the Mate 9’s rear camera is relatively slow when compared to other smartphone models. Shooting pictures usually takes just a bit longer than you’d optimally like it to, which can become annoying at times. 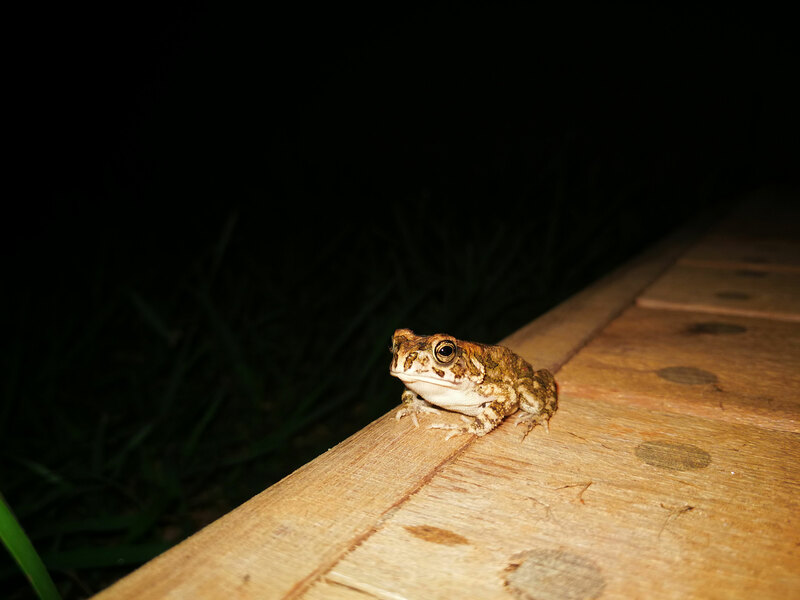 The phone also occasionally requires you to hold the device steady for roughly another second so it can further enhance sharpness. Focusing on people or objects also proved “laggy” and slightly delayed. 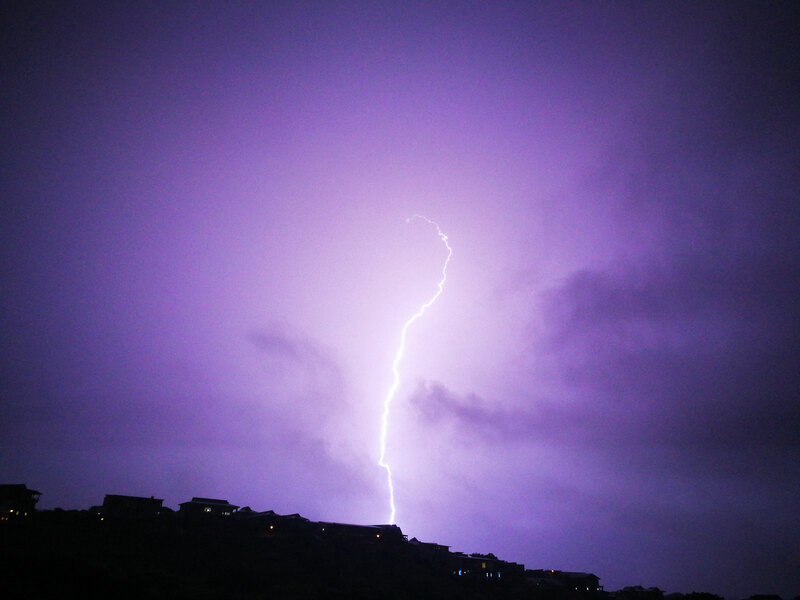 Because the camera lacks speed most of the time, the Mate 9 isn’t the ideal choice if you’re keen on snappy photography. To put the Leica dual-sensor rear camera to the test and sample its quality in real-life situations, we captured a whole range of images from both close-up and faraway. Although capturing lightning with a device that isn’t as responsive as hoped for ultimately proved to be quite a challenge, the result is simply superb. In a nutshell, the Mate 9 can certainly measure up to the highest-ranking smartphones like the iPhone 7 and Galaxy S7 (just not in speed). Performance-wise, Huawei has been doing quite well with its in-house designed Kirin system-on-a-chip (SoC). Although the chips don’t excel in the graphics department when stacked up against rivals from Samsung and Qualcomm, that should be sorted out now with the brand-new Kirin 960. While its predecessor, the Mate 8, was powered by a Kirin 950 chip running on four Mali T880 cores, the Kirin 960 features no less than eight Arm G71 cores. This new 16nm SoC uses the big.Little concept and therefore houses four fast 2,4GHz A73-cores for intensive tasks and four energy-efficient 1,8GHz A53-cores. In addition, the GPU now uses the latest Bifrost architecture, which should, in theory, provide for a faster and more energy efficient result. To further improve and optimise performance, Huawei has incorporated a new kind of machine-learning algorithm into the Mate 9. This intelligent software learns from the user’s behaviour patterns and should give the highest priority apps preference with regards to system resources. In the end, this technology is claimed to ensure a long-lasting, smooth experience. To see how all this technology is put to effect, we ran several tests to quantify performance. All results were then directly compared to those of last year’s Mate 8, the more affordable Huawei Nova and high-end flagship phones from other brands. The Geekbench 4 cross-platform multi-core test, which simulates real-world tasks and applications primarily stressing the CPU, showed the Mate 9 to be an absolute top performer. The new Huawei Nova, on the other hand, is considerably less of a powerhouse, yet still fast enough for smooth sailing. 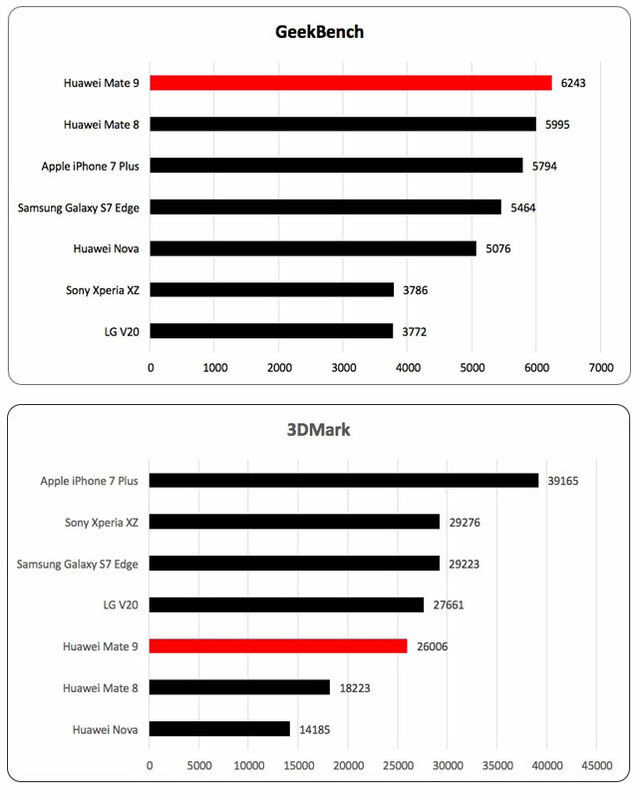 The 3DMark Ice Storm Unlimited benchmark revealed less impressive results, with the Mate 9 being outrivalled by Apple, Samsung, LG and Sony in the graphics department. The Huawei Nova phone finishes last in this GPU test and is therefore not the best choice when you’re keen on playing the latest 3D games. The Mate 9 packs enough punch to run the newest generation of mobile 3D games without any problems. As mentioned, the Mate 9’s display doesn’t offer the highest number of pixels that current state-of-the-art technology has to offer, so it should have a noticeable positive impact on battery life. A lower number of pixels simply requires less energy. Like with its predecessor, the new Mate 9 comes with a 4 000mAh capacity. To determine how that number translates into real-life working hours, we ran two battery draining benchmarks to emulate realistic user-scenarios while keeping screen brightness of all devices identical (just to keep comparison honest and fair). The browser test, which follows a script that continuously keeps the devices browsing, and scrolling through, various websites until there is no more power left, showed the Mate 9 to last almost 12 hours. This is significantly more than high-end phones from Apple, Samsung, Sony and LG. The Huawei Nova, however, will not last for more than a disappointing six hours and 15 minutes in this test scenario. Taking some idle time into account, the Mate 9 should last for almost 14 hours straight, which is quite an accomplishment. The Nova will, at best, offer eight hours of battery life when not continuously in use. The second test stressed the devices by displaying non-stop, full-HD content until energy was depleted. 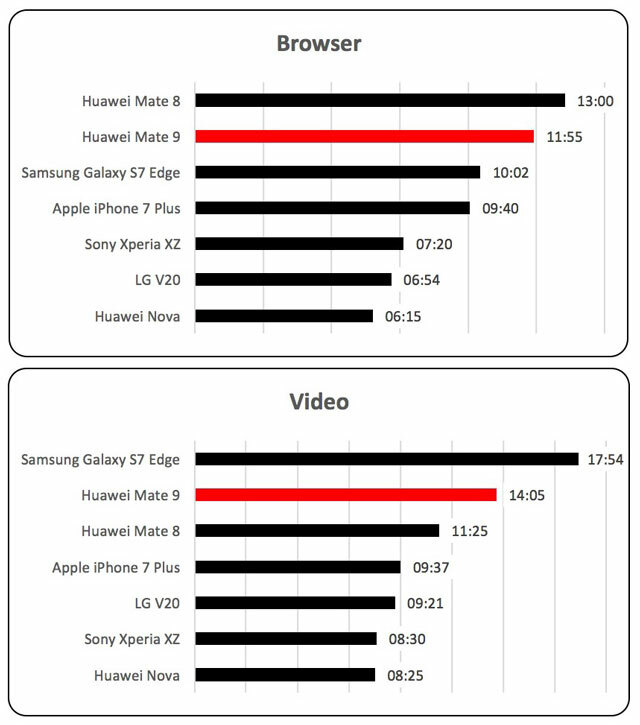 This time, the Mate 9 was unable to outlast the excellent Samsung Galaxy S7 Edge (17 hours and 54 minutes), but had no problem functioning significantly longer (14 hours and five minutes) than the rest of the tested devices. Again, the Huawei Nova finished last, with only eight hours and 25 minutes of video playback. The Huawei Mate 9 fully supports SuperCharge technology, and Huawei decided to include the required charger with the phone — a big plus! Measurements concluded that after only 30 minutes of charging, the Mate 9 showed a massive 55% battery increase. As a reference point, the Samsung Galaxy S7 Edge saw a 40% increase in the same test and the Apple iPhone 7 Plus only 18%. Huawei’s Nova presented a battery increase of 19% after half an hour of charging. Bottom line: the Huawei Mate 9 is currently the fastest charging phone on the market. Due to its huge, 5,9-inch screen, the Huawei Mate 9 isn’t automatically a perfect fit for everybody. However, if you’re explicitly looking for an extra-large Android phone, this device ticks most of the boxes. Its biggest pros are the long battery life, high performance, rugged build quality, 64GB of extendable storage, quick charging and excellent rear camera. The main cons are its boring design, screen resolution not being on par with its size, a camera that lacks speed, a poorly implemented infrared feature and unimpressive GPU performance. In the end, the Huawei Mate 9 is a complete, premium and practical phone with some great features. For the amount of money it will set you back, we can’t shake the feeling that just slightly better hardware could have completely justified the price tag. Previous ArticleIs it all over for Internet banking?